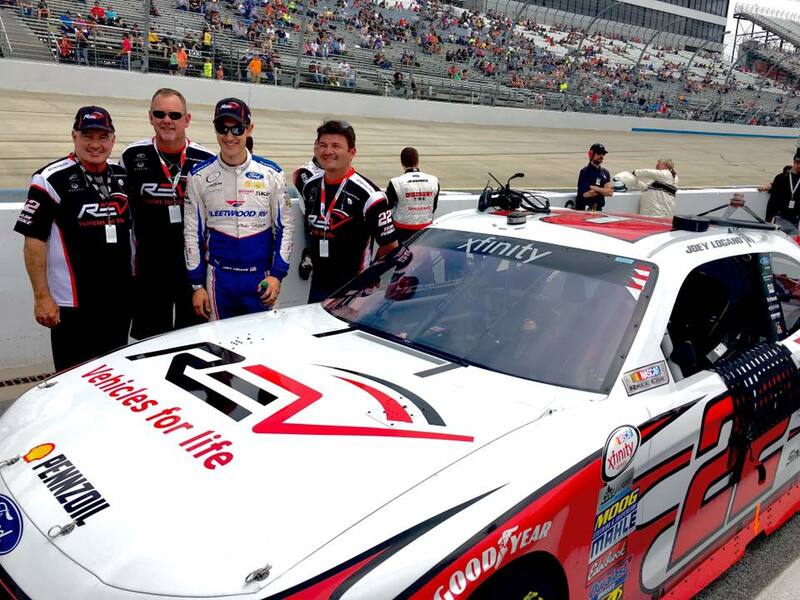 DOVER, DE --(Marketwired - May 17, 2016) - The Fleetwood RV logo was featured on Team Penske driver Joey Logano's red and white No. 22 Ford Mustang during Saturday, May 14's Ollie's Bargain Outlet 200 NASCAR XFINITY race at Dover International Speedway. The race was televised on FOX. In February, Fleetwood's parent company, REV Group, entered a multi-year partnership with Team Penske; Saturday marked the first time the Fleetwood logo appeared on one of Team Penske cars. The memorable RV icon was displayed on both sides of the car, as well as on the deck lid and TV panel. The 25-year-old is the second star-studded racing name that REV Recreation Group has backed during the 2016 racing season. On March 7, three-time Indianapolis 500 champion Helio Castroneves was presented his own custom-made American Coach, a sister brand of Fleetwood RV. The coach was presented to Castroneves in Decatur, Ind., where Fleetwood builds its coaches at REV Recreation Group's manufacturing facilities. Logano drove his way to a seventh-place finish in Saturday's race after beginning the main event from the same position based on his finishing spot in the first of two heat races to set the field. Logano worked his way to the fourth position by the end of the 40-lap preliminary event to earn the starting position. Logano kept the No. 22 Ford inside the Top 10 of the main, 120-lap event until the first caution on Lap 71. The Team Penske crew made air pressure adjustments on the four-tire stop, gaining two positions. Logano would drive the red and white No. 22 machine to the fifth position by Lap 81, where he would remain until the final caution of the event on Lap 109. The team remained on the track while other cars on the lead lap pitted, moving the No. 22 REV-sponsored Ford Mustang to the third position. On the ensuing restart, Logano found himself trapped in the low lane to cross the finish line in the seventh position. Dubbed the "Monster Mile," Dover International Speedway is the world's fastest 1-mile oval track with drivers turning laps at speeds up to 170 mph in less than 23 seconds. REV Group, Inc., formerly Allied Specialty Vehicles (ASV), is a +$1.7 billion manufacturer of industry-leading motor vehicle brands serving recreation, commercial and emergency markets. Within the commercial division, REV offers a full lineup of buses, sweepers, terminal trucks and mobility conversion vehicles. The emergency division offers a complete line of fire apparatus and ambulance vehicles. Within the recreational vehicle division, the company produces motorized RVs under several of the industry's most iconic brands, including Fleetwood RV, Holiday Rambler, Monaco Coach and American Coach. For more details about Fleetwood RV, visit fleetwoodrv.com. To learn more about REV, Fleetwood's parent company, visit revgroup.com.